Mr. Jean-Pierre Bemba Gombo, centre, in an ICC courtroom in 2010. 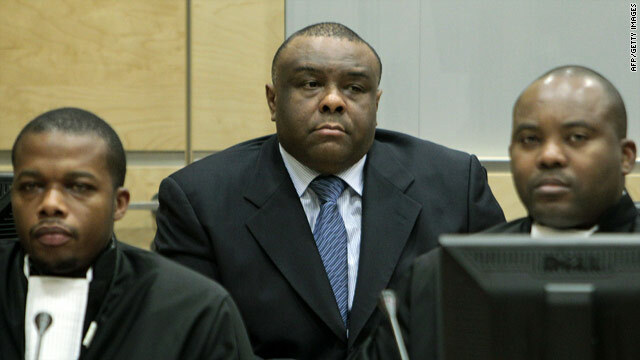 The Prosecution and Defense in the trial of Jean-Pierre Bemba Gombo, former Vice President of the Democratic Republic of Congo (DRC) and commander-in-chief of the Movement de Libération du Congo (MLC), presented their closing oral statements on the 12th and 13th of November 2014. The Prosecution requested judges to convict Bemba whilst the Defense counsel requested an acquittal. Jean-Pierre Bemba Gombo is charged with two counts of crimes against humanity and three counts of war crimes allegedly committed in the Central African Republic (CAR) in 2002-2003 by troops under his control; his trial commenced on 22 November 2010. Following these closing statements, the judges will deliberate and pronounce judgment on the case. A date for delivery of the judgment is yet to be scheduled. Meanwhile, on the 11th November 2014, Pre-Trial Chamber II of the International Criminal Court (ICC) confirmed the charges of offences against the administration of justice for Jean-Pierre Bemba Gombo and four of his associates, Aimé Kilolo Musamba, Jean-Jacques Mangenda Kabongo, Fidèle Babala Wandu and Narcisse Arido. The chamber has committed the five suspects to trial. The confirmed charges, of offences against the administration of justice, are in connection with witnesses’ testimonies committed between the end of 2011 and 14 November 2013. The Chamber however, declined to confirm the charges brought by the Prosecutor in connection with the alleged presentation of false or forged documents.